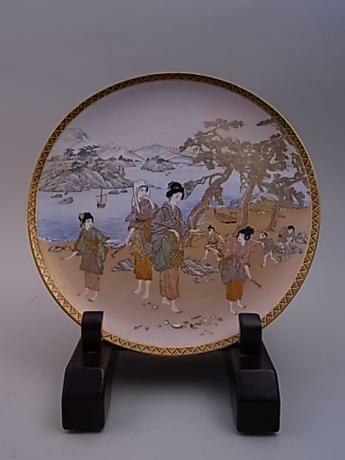 Japanese 20th century porcelain figure name ISHIBASHI. 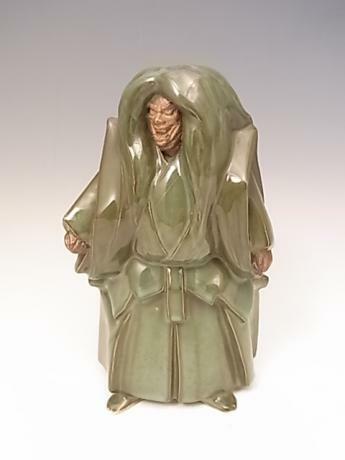 This character is from the Noh Play Sakkyo. The figure measures 7 3/4" tall, 4 1/2" wide and 3" deep. Comes with TOMOBAKO, or original artist signed wooden storage box. 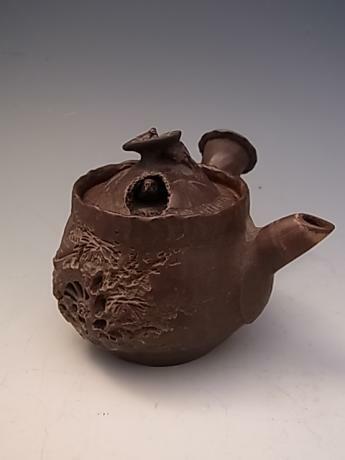 Japanese early 20th century BANKO-ware teapot. The teapot has the design of water wheel incised into the side. Also on top, there is a small bird that comes peaking out of a hole when the teapot is tilted. The knob on the lid is in the shape of a mushroom. 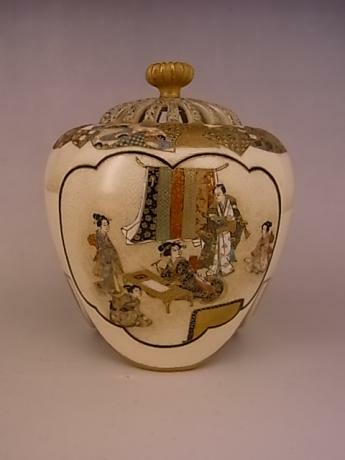 The pot has a chop mark reading "BANK..
Japanese early 20th century SATSUMA vase by KINKOZAN - SENZAN. 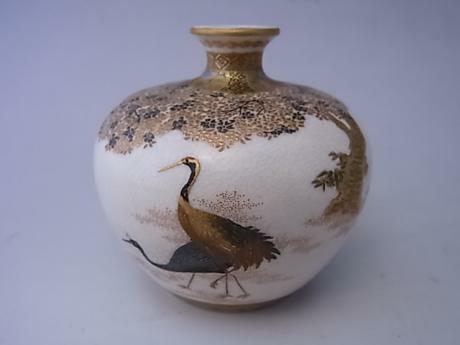 The vase has the rare and unusual design of turkeys. The vase also has wonderful pierced work. 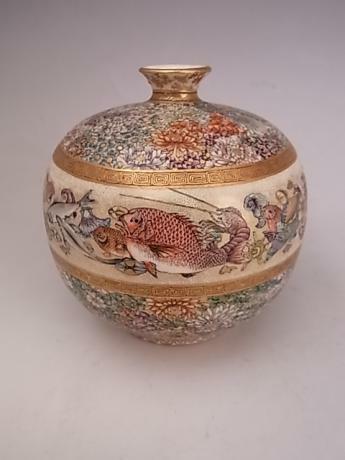 The vase measures 11 7/8" tall and 6" in diameter. KINKOZAN written on bottom and SENZAN written on the area with the turkeys. 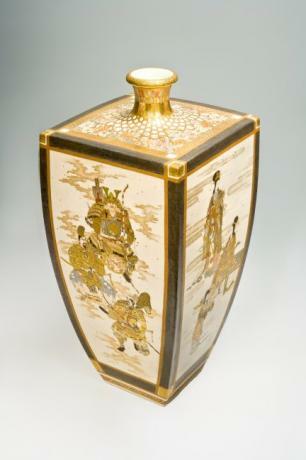 (rukane..
Japanese MEIJI Period KINKOZAN SATSUMA vase. 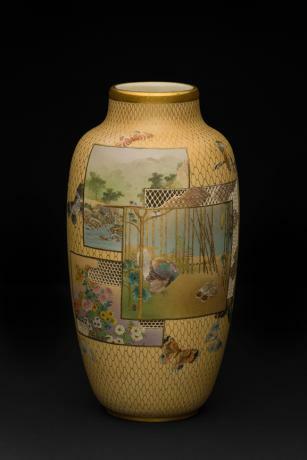 The vase has horizontal bands of designs. 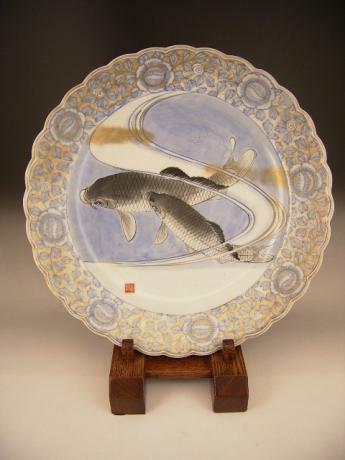 The lip is done in a leaf pattern, the next band is a geometric pattern, next is a wide floral pattern, another gold geometric pattern, next a wide band with an assortment of fish and shellfish beautifully ren..
Japanese circa 1900 blue and white IMARI charger with KOI design. 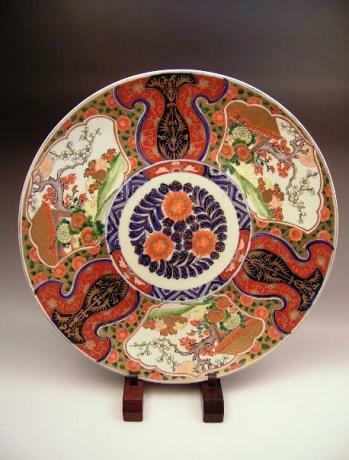 The plate measures 15 3/4" diameter and 2 3/8" height.